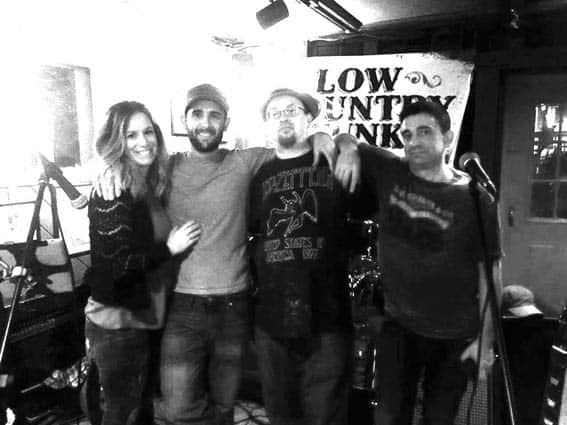 Make sure you head to Outback Pizza on Saturday night at 9 p.m. to see Low Country Funk (LCF). I first saw them in December at the memorial tribute concert for Steve Audsley. I had already seen most of the acts on the bill, but I only knew LCF by name, having listed them in the paper. They performed Sugarland’s “Something More” and it blew me away. The band (Blake Gowan, drums; Nick Vittone, bass; and Neil Blanchette, guitar) was very tight and lead singer Michelle Kenny—wow, can she sing! I had the pleasure of speaking with Kenny and Blanchette and learned more about LCF. The band formed in May 2014. Blanchette told how it happened: “Me, Nick and Blake had played together for a while and we already sort of developed a musical language. We crossed paths with Michelle and she sang and knew all this country music which was a bit different to what we had been playing. We already had the connection to be able to play songs together, it was just a matter of being able to learn country songs. It worked right from day one and it was pretty amazing.” Their first gig was at Center Street Alley in Rutland. Blanchette came up with the name very early on, very quickly. They were playing the song “Funk 49” by Joe Walsh quite a bit, ripping it up, and people were really responding to it. When naming the band came up, that song was part of the discussion. Their country songs have an edge to them and get a little funky. They’re not sure where the “Low” part came from, but it works. Blanchette said it sounded cool right off the bat. The guys had been playing mostly rock. Gowan came from a jam band with Grateful Dead influence. Vittone’s background was 90s grunge music and Blanchette was coming from a Jimmy Page-, Eric Clapton-style. Blanchette said, “We came from different places and developed this unique sound and then with Michelle coming in and singing Miranda Lambert, Lady Antebellum stuff, we were trying to wrap our heads around that. It was a good study and challenge and it seemed to work.” What also works is that LCF is a cohesive unit. There is no leader, no one person who stands out. They try to collaborate equally. Kenny is as homegrown as they come, having grown up in Rutland. She started singing in church. Her grandfather was a pastor at the Mendon church and her uncle is currently the preacher there. She spent a lot of time there as a kid but it wasn’t until a trip to Nashville decades later that propelled her to pursue music. She recorded a couple songs in a studio down there with a friend who was also doing some recording. “I went down there for the experience and I got to record a little bit and that’s what really spurred me to really want to continue my music and find something to be a part of. When you’re a musician, your life kind of feels empty without it. When you find it, which I did, it’s a fantastic situation,” Kenny explained. LCF has been building a pretty good following. Kenny said, “Our fan base essentially follows us around pretty much wherever we go. We have a lot of support from people who have heard us play. It’s modern country music that you hear on the radio with a real side of rock that you don’t hear on the radio. The fun we’re having and the energy we create as a band, really somehow is felt by our audience because they respond. That is one of my favorite things about being in a band. We get to watch that happen and watch that dynamic between the crowd and the band continue to grow over the course of a night. Then we’ll throw in a traditional rock song like “Guns N’ Roses” or something of that nature and people go wild. It’s fantastic.” I’m not a country music guy at all but they have made a fan out of me. This band is definitely on the rock side. Blanchette said what people hear on the radio is so polished, but LCF has just drums, guitar and bass. Most of these country recordings there are two or three guitars, but they cover it well with just his (Blanchette’s) and Vittone’s bass. “Nick really ties it all together. He’s has been able to build that bridge, the rhythm and melody really to a point where I’m so comfortable that I feel free to do what I do. Blake is predictable as a drummer and that’s great and he plays the part. He adds to that wall of sound, he’s a pro and has been doing this for 20 years and has played with all kinds of different people. He brings such a solid foundation that Nick can leap from and create something that I can totally trust and lean back on and flourish. We’re all aiming at the same target so it really sounds cohesive,” said Blanchette. Would like to connect with you to see about you playing for us at American Legion in Brandon VT. Phone number to reach me is 802-377-1168. Hope to hear from you soon.